Well-Being, and Natural Insight (Mount Baldy Press, Inc. (forthcoming)). Now, you can enjoy more energy, greater intuition, and a better sense of well-being. This book is filled with beautiful illustrations by graphics artists Ira Liss and Peter Sorensen. Maximize your planetary potential today with Planetary Intelligence! 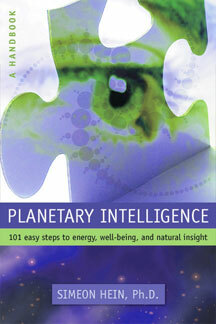 Buy the downloadable eBook version of Planetary Intelligence (Adobe PDF format) for only $4.95. Better yet, order softcover copy of the book to be published in March 2006, all for $9.95. As part of this special softcover offer you will get a signed, numbered copy of the book together with a special postcard. This offer comes with free shipping and a Money-Back Guarantee. For an extra special deal, buy the Planetary Intelligence softcover and receive a signed copy, and also get a new, personally signed softcover copy of Opening Minds with free shipping for only $24.95.